I'll be spending most of November frantically split between rewriting Walkabout (from an incoherent bunch of word documents, scraps of paper into a format ready to be playtested), creating sculptures, etching metal for the purposes of fine art prints, painting WW2 style bomber art on sheets of metal, and tasting more varieties of alcoholic beverage than most people get through in a lifetime (while getting paid to do so). If I survive November, the aim is to get a pre-production copy of Hell on Eight Wheels printed, get a bit more refinement and playtesting happening on Walkabout, and then to start work on the first "Pocketmod Playbooks" game. General feedback from G+ indicates that I should produce this first game based around the concept of scavengers in the fallen cities of the Walkabout world. (several people commented and virtually all of their comments pointed the same way). I think a follow up game might explore the Goblins from last year's tarot deck. Warning: This could get controversial, I'm basically in "Rant Mode". I thought about the "Conan" news this week, Arnold Swarzenegger reprising the role. Ignoring the sequel "Conan the Destroyer", ignoring the Jason Momoa remake. I liked the newest movie version of Conan, I've encountered people in extended circles of social-media friends who worked on it, both script-wise and effect-wise. I heard that these fans behind the scenes had planned to stick as close to the source material as possible, but had some "suggestions" from studios and producers. They didn't quite get the movie they wanted, but it was probably closer to what they expected. While I'm on my Pocketmod kick, I've had another idea. It basically draws from Apocalypse World, where a number of character playbooks are only available through specific channels (monsterhearts also did this by including a limited edition skin for those who participated in the crowdfunding). The idea is to produce a range of Pocketmod Playbooks that are only available through certain means, or at certain times of the year. Since each Pocketmod Playbook is a self contained character or scenario, there could be seasonal items (eg. a Halloween scenario available only during October each year), or items only available at specific online stores or forums (eg. a specific character type only available at my RPGNow store, another one only available at my website). A limited character only available one day of the year, a specific promotional scenario that is limited to fifty downloads (once it's gone, it's gone). This might tie into long term gaming continuity. This year NaGaDeMon seems to be getting a decent crowd of participants. I've already put my hand up with the intention of getting a finalised second edition of Walkabout into people's hands (the first edition was created for Game Chef 2010). I'm hearing a few good things about some of the other games that people are intending to produce. For everyone who is participating, good luck. For those who aren't, go and have a look at the Google plus page or the Facebook group. They seem to be the two places where the action is focused. In the pocketmod, there is a front page, a back page and three double page spreads in the middle of the booklet. This offers some great opportunities for formatting...stuff that you just don't get when you're stuck with a single page. It's based off an idea I've been toying with for a while...a way to speed up combat while giving it a strategic edge. 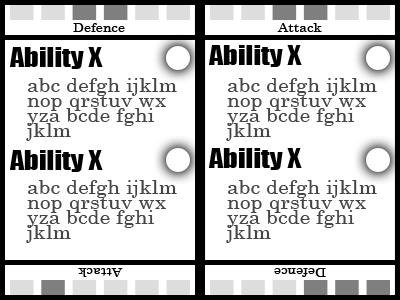 The first double page spread would probably have some flavour text about the character type, the middle and last double page spreads would provide a range of abilities (some of which might be granted automatically, others bought with XP). The fun bit is the formatting in the top and bottom margins. Whether you hold the page right way up, or upside down, there is a defence matrix on the left and an attack matrix on the right. With three double page spreads, you get six different combat strategies you could use. There seems to be a growing community of game designers working on the Pocketmod platform. A single sheet, folded and cut in such a way that it produces a tiny eight page booklet that can fit in a pocket or a wallet. It's similar to the ideas that have been floating around the roleplaying community for at least two decades now...an entire game on a single sheet of paper. I've been thinking about the concept, and taking my own spin on it. How about a game in three parts. Part 1: Core rules that everyone uses. These are the basics of the game divided into eight small pages. Part 2: Character booklets. Everyone gets their own character booklet based on their character's specific type or class. The front page is a title, the back page is statistics, and the middle is an explanation of powers and abilities specific to this character. I’ve thought a bit more deeply about my last post. All of the examples I’ve given have related to a single axis. The “Redneck” example was a single linear axis, so was the WW2 “Jewish” example; a single axis of relationship gives the idea of one-dimensional characters. The relationship system is far more than this. A simple expansion of the examples shows how the relationship system could be much more complex and richer for the purposes of character exploration. I’ll pick a new example for this…something that fits better with the themes of Walkabout. A scattering of neighbouring local communities have developed their own opinions about the dangers in the world and the best ways to deal with them. Some individuals are fanatical about their opinions; others are more reasonable and willing to listen to helpful suggestions from their fellow survivors. I’ve been thinking about the notion of relationships within the mechanisms of Walkabout. All characters are defined by a series of traits that define their ability to impact the world around them using the forces within. All characters also have a range of relationships that provide a more powerful ability to transform the world using allied forces linked spiritually to concepts that they identify with. Someone calling themselves a “warrior”, who does the leg work to become a “warrior” and who acts as a “warrior” gains a bonus when performing the actions traditionally associate with a “warrior”. Similarly, someone calling themselves a “drug dealer”, who does the leg work to become a “drug dealer” and who acts as a “drug dealer” gains a bonus when performing the actions traditionally associate with a “drug dealer”. In many of the Aboriginal tribes across Australia, there are traditional gender roles. Some things are simply designated as men's business, while others are designated as women's business. Modern anthropologists might look back on these groups and find the cultural dynamic sexist, perhaps the men went out and hunted and the women did work around the hearth. Modern feminists might be offended by the notion that women were relegated to certain roles within the community, but men were similarly relegated to predetermined communal roles. If you were a man, you would undertake men's business. If you were a woman, you would undertake women's business. Men didn't talk about women's business, and women didn't talk about men's business. Some groups may have had strict taboos, but in most cases the roles were simply ingrained cultural mores. It wouldn't cross a man's mind to engage in women's business, it's just not what is done. Interspersed through the rest of the year, I’m going to look at a couple of core rulebooks to see how they are laid out. With pros, cons and some critique about the game based purely on the layout, and the things presented in the rules. I'm doing this because I'm interested in the way different games present their systems and settings, in the hope that I'll be able to learn something from them and get things right with the games released by Vulpinoid Studios. I’m envisioning this third part of the boxed set to be a travelling novella. The whole thing will be framed by the journey of a single person across the beautifully desolate landscape…it will be illustrated in colour (using a combination of techniques), and I’m thinking that it should weave the tale of a woman journeying in this exotically familiar world. I’m aiming toward something akin to a post-apocalyptic version of “The Canterbury Tales” or “1001 Nights”. The Heroine will meet people on her journey, and these chance encounters will tell her their stories. The stories are designed to bring a personal perspective to the savagery and esoteric mystery, providing ideas for players and GMs to insert into their stories. Each of these stories would be about ten pages long (probably four or five of these), interspersed with the framing narrative of a character completing her journey along one side of the Australian coast. Since Walkabout will be divided into a series of books, some with rules and some without, I'll be writing up the non-rule books in the form of a travel guide to the new world. This is a tentative outline for the second book, I can certainly see that some parts of the book could easily blow out to twice their size (or more), but the aim is to keep the book fairly concise. This book is meant to be the kind of thing that a novice adventurer might actually carry around with them while they are coming to grips with the strange world outside of the city where they grew up.